This confirms as expected big gravity events. Such events are like waves in water where water is the media and the black holes are the wave driver. This is still quite different from the actual wave length of gravity itself which is radiated by all matter independent of actual movement relativistic or otherwise. I really do not think that we can actually detect that at all and it may not have a natural wave structure at all. I will not know until i attempt some subtle calculations which are naturally problematic. We are tackling empirical infinity head on with this. What is plausible is that gravity provides a nearly mathematically continuous effect as i think plausible helping to provide the material medium for the big gravity waves..
Scientists have proven the existence of gravitational waves in the universe, confirming Albert Einstein’s last unproven theory. In one of the biggest scientific breakthroughs in decades, researchers at the Laser Interferometer Gravitational-Wave Observatory, or LIGO experiment have finally detected the cosmic ripples, after 10 years of trying. The idea of gravitational waves was first put forward by Einstein in his ‘Theory of General Relativity’ 100 years ago and has been generally accepted by the scientific world but never before been proven. Gravitational waves are concentric ripples in the fabric of spacetime, created by the collisions of black holes. According to Einstein, space and time are in fact interwoven in a single continuum called spacetime. Rather than being a void, spacetime is a four-dimensional ‘fabric’ that can be pushed and pulled as objects move through it. This means that an object moving through spacetime creates ripples, similar to an object moving through water and making waves. Small ripples, or gravitational waves, made by small objects in space fade out relatively quickly. However, those created by massive objects such as black holes, continue to spread all the way to Earth. As a gravitational wave passes, it stretches space in one direction and shrinks it in a perpendicular direction (at a right angle). LIGO is made up of two huge instruments and can detect these changes using a laser beam which is split into two and sent off at perpendicular angles. A passing gravitational wave can change the distance that each beam travels compared to its twin. The gravitational waves were detected on September 14, 2015 at 5:51 a.m. Eastern Daylight Time (09:51 UTC) by both of the twin Laser Interferometer Gravitational-wave Observatory (LIGO) detectors, located in Livingston, Louisiana, and Hanford, Washington, USA. The LIGO Observatories are funded by the National Science Foundation (NSF), and were conceived, built, and are operated by Caltech and MIT. The discovery, accepted for publication in the journal Physical Review Letters, was made by the LIGO Scientific Collaboration (which includes the GEO Collaboration and the Australian Consortium for Interferometric Gravitational Astronomy) and the Virgo Collaboration using data from the two LIGO detectors. Based on the observed signals, LIGO scientists estimate that the black holes for this event were about 29 and 36 times the mass of the sun, and the event took place 1.3 billion years ago. About 3 times the mass of the sun was converted into gravitational waves in a fraction of a second—with a peak power output about 50 times that of the whole visible universe. By looking at the time of arrival of the signals—the detector in Livingston recorded the event 7 milliseconds before the detector in Hanford—scientists can say that the source was located in the Southern Hemisphere. According to general relativity, a pair of black holes orbiting around each other lose energy through the emission of gravitational waves, causing them to gradually approach each other over billions of years, and then much more quickly in the final minutes. During the final fraction of a second, the two black holes collide into each other at nearly one-half the speed of light and form a single more massive black hole, converting a portion of the combined black holes’ mass to energy, according to Einstein’s formula E=mc2. This energy is emitted as a final strong burst of gravitational waves. It is these gravitational waves that LIGO has observed. The new LIGO discovery is the first observation of gravitational waves themselves, made by measuring the tiny disturbances the waves make to space and time as they pass through the earth. “Our observation of gravitational waves accomplishes an ambitious goal set out over 5 decades ago to directly detect this elusive phenomenon and better understand the universe, and, fittingly, fulfills Einstein’s legacy on the 100th anniversary of his general theory of relativity,” says Caltech’s David H. Reitze, executive director of the LIGO Laboratory. 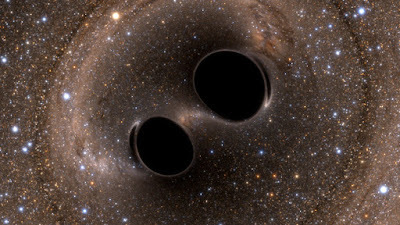 The discovery was made possible by the enhanced capabilities of Advanced LIGO, a major upgrade that increases the sensitivity of the instruments compared to the first generation LIGO detectors, enabling a large increase in the volume of the universe probed—and the discovery of gravitational waves during its first observation run. The US National Science Foundation leads in financial support for Advanced LIGO. Funding organizations in Germany (Max Planck Society), the U.K. (Science and Technology Facilities Council, STFC) and Australia (Australian Research Council) also have made significant commitments to the project. Several of the key technologies that made Advanced LIGO so much more sensitive have been developed and tested by the German UK GEO collaboration. Significant computer resources have been contributed by the AEI Hannover Atlas Cluster, the LIGO Laboratory, Syracuse University, and the University of Wisconsin- Milwaukee. Several universities designed, built, and tested key components for Advanced LIGO: The Australian National University, the University of Adelaide, the University of Florida, Stanford University, Columbia University of the City of New York, and Louisiana State University. LIGO research is carried out by the LIGO Scientific Collaboration (LSC), a group of more than 1000 scientists from universities around the United States and in 14 other countries. More than 90 universities and research institutes in the LSC develop detector technology and analyze data; approximately 250 students are strong contributing members of the collaboration. The LSC detector network includes the LIGO interferometers and the GEO600 detector. The GEO team includes scientists at the Max Planck Institute for Gravitational Physics (Albert Einstein Institute, AEI), Leibniz Universität Hannover, along with partners at the University of Glasgow, Cardiff University, the University of Birmingham, other universities in the United Kingdom, and the University of the Balearic Islands in Spain. “This detection is the beginning of a new era: The field of gravitational wave astronomy is now a reality,” says Gabriela González, LSC spokesperson and professor of physics and astronomy at Louisiana State University. “The description of this observation is beautifully described in the Einstein theory of general relativity formulated 100 years ago and comprises the first test of the theory in strong gravitation. It would have been wonderful to watch Einstein’s face had we been able to tell him,” says Weiss. “With this discovery, we humans are embarking on a marvelous new quest: the quest to explore the warped side of the universe—objects and phenomena that are made from warped spacetime. Colliding black holes and gravitational waves are our first beautiful examples,” says Thorne. Virgo research is carried out by the Virgo Collaboration, consisting of more than 250 physicists and engineers belonging to 19 different European research groups: 6 from Centre National de la Recherche Scientifique (CNRS) in France; 8 from the Istituto Nazionale di Fisica Nucleare (INFN) in Italy; 2 in The Netherlands with Nikhef; the Wigner RCP in Hungary; the POLGRAW group in Poland; and the European Gravitational Observatory (EGO), the laboratory hosting the Virgo detector near Pisa in Italy. At each observatory, the two-and-a-half-mile (4-km) long L-shaped LIGO interferometer uses laser light split into two beams that travel back and forth down the arms (four-foot diameter tubes kept under a near-perfect vacuum). The beams are used to monitor the distance between mirrors precisely positioned at the ends of the arms. According to Einstein’s theory, the distance between the mirrors will change by an infinitesimal amount when a gravitational wave passes by the detector. A change in the lengths of the arms smaller than one-ten-thousandth the diameter of a proton (10-19 meter) can be detected. “To make this fantastic milestone possible took a global collaboration of scientists—laser and suspension technology developed for our GEO600 detector was used to help make Advanced LIGO the most sophisticated gravitational wave detector ever created,” says Sheila Rowan, professor of physics and astronomy at the University of Glasgow. Independent and widely separated observatories are necessary to determine the direction of the event causing the gravitational waves, and also to verify that the signals come from space and are not from some other local phenomenon. Toward this end, the LIGO Laboratory is working closely with scientists in India at the Inter-University Centre for Astronomy and Astrophysics, the Raja Ramanna Centre for Advanced Technology, and the Institute for Plasma to establish a third Advanced LIGO detector on the Indian subcontinent. Awaiting approval by the government of India, it could be operational early in the next decade. The additional detector will greatly improve the ability of the global detector network to localize gravitational-wave sources. “Hopefully this first observation will accelerate the construction of a global network of detectors to enable accurate source location in the era of multi-messenger astronomy,” says David McClelland, professor of physics and director of the Centre for Gravitational Physics at the Australian National University.